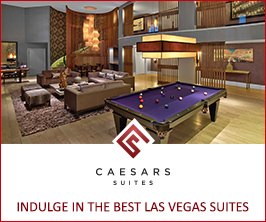 LAS VEGAS (Jan. 16, 2019) – In honor of the Lunar New Year, Caesars Entertainment Las Vegas resorts will celebrate the Year of the Pig with festive programming, special dining offers and traditional lion dances across the city. Attracting thousands of guests in previous years, the four-day Spring Festival at The LINQ Promenade will kick off with a ribbon cutting ceremony on Wednesday, Feb. 6 at 5 p.m. Additionally, each of the nine Las Vegas resorts will welcome visitors with elaborate decorations in the lobby and common areas including hanging lanterns, banners, firecrackers and floral arrangements. To kick off the Lunar New Year celebrations, guests are invited to attend the ribbon cutting ceremony with Chinese dignitaries and government officials at The LINQ Promenade Fountain Stage on Wednesday, Feb. 6 at 5 p.m. 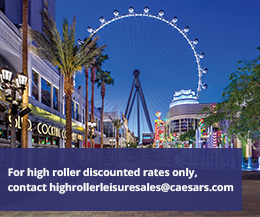 The High Roller, known as the world’s tallest observation wheel and an iconic landmark in the Las Vegas skyline, will celebrate with a nightly light show every hour starting at 6:30 p.m. Throughout the four-day festival, guests will be taken on a journey around the world as they experience live cultural performances by Guizhou Arts Troupe on The LINQ Promenade Fountain Stage. Traditional lion dance performances by Lohan School of Shaolin will occur nightly at 6 p.m. as well. Additional live performances featured on The LINQ Promenade Fountain Stage will be dedicated by Nevada Ballet Theater, Caesars Entertainment performers, New East West Chinese School and more. Guests can also enter to win prizes daily from a lucky drawing, with a winner announcement at 8:30 p.m. each night. Honoring Chinese New Year, the iconic Caesars Palace will delight guests with a variety of distinct dishes and specials at multiple restaurants, such as Beijing Noodle No. 9, Tiger Wok & Ramen, MR CHOW and the award-winning Bacchanal Buffet. The Forum Shops at Caesars Palace will welcome visitors during the celebratory season with dazzling décor, a festive parade, retail special offerings and more. The premier luxury retail destination will once again welcome a 22-ft. long, 6-ft. wide and 12-ft. high illuminated dragon display, providing a stunning photography opportunity for visitors. A legendary creature in Chinese mythology and folklore, the dragon is a traditional symbol of power, strength, and good luck. The massive 950-lb steel-framed dragon is covered in 30,000 red and amber LED lights, many of which flicker, giving the mythical beast a vibrant look and dynamic feel. The impressive display was custom created exclusively for The Forum Shops and is on display beginning Jan. 9 and throughout February. For the 23rd consecutive year, The Forum Shops at Caesars Palace will welcome students from The Meadows School, who will perform the traditional dragon parade throughout The Forum Shops at Caesars on the first day of Chinese New Year Tuesday, Feb 5 beginning at 9 a.m. The cast of singers and dancers includes 120 students from The Meadows School – 60 from kindergarten and 60 from fifth grade. A Chinese New Year brochure featuring exclusive retail offers at The Forum Shops will be distributed by special greeters during the celebratory season as well as at The Forum Shops Guest Services Centers and Forum Shops Valet. Keeping up with the Chinese tradition, Caesars Entertainment Las Vegas resorts will host 13 lively lion dances to bring good luck across the city, including nightly performances at The LINQ Promenade from Wednesday, Feb. 6 through Saturday, Feb. 9. At each of the nine resorts, the lion dance performances will start at the porte cochère and make their way through the casino from Friday, Feb. 8 through Wednesday, Feb. 13.